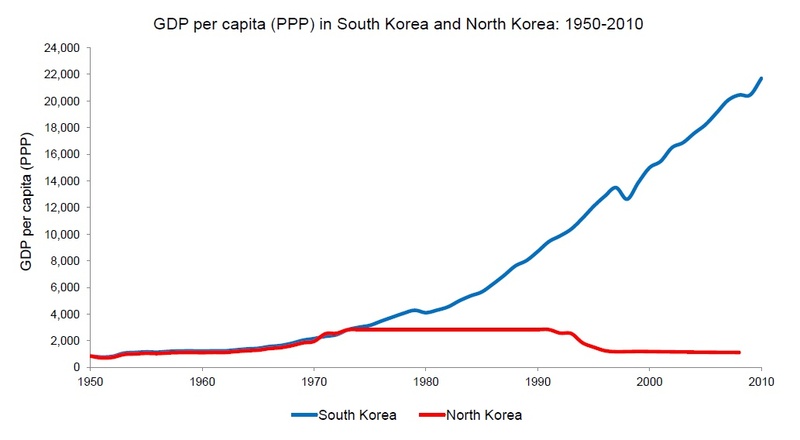 In this post I plot the change in GDP per capita (PPP) between 1950-2010 in a number of communist countries (namely, the former USSR, Cuba, Cambodia, China and North Korea). In each case, I compare the change to the corresponding change in one or two neighbouring (or otherwise similar) countries that had more liberal economic arrangements over the time-period in question. Unsurprisingly perhaps, by 2010 the cumulative differences in per-capita production between the communist and non-communist countries are huge. The data (which I will briefly discuss at the end) are from the Maddison Project. 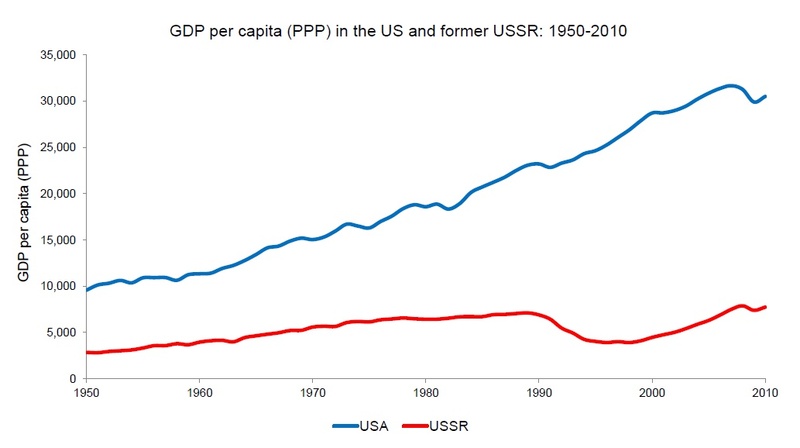 All of the communist countries I consider underwent major social conflict between 1950-2010, so it is not clear how much of their lack of increase in production is due to communism, as opposed to social conflict. However, some people would argue that social conflict is inherent to communism, meaning that it does not make sense to speak of the effect of communism on production absent of social conflict. I should also add that I am certainly not an expert on any of the countries' histories or current affairs. 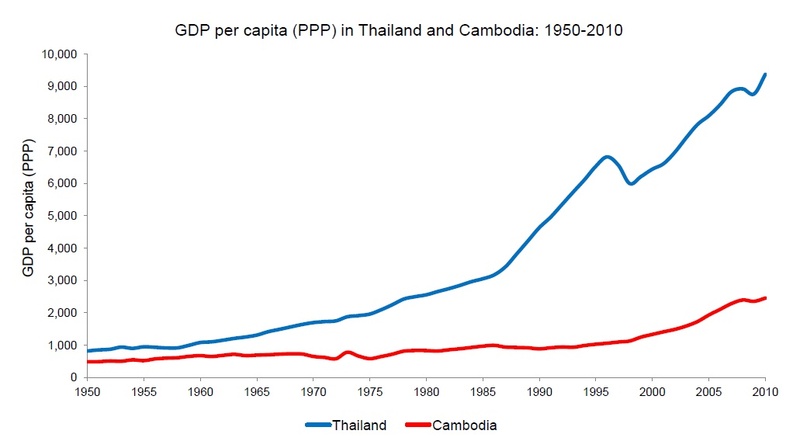 My understanding is that Cambodia is no longer a communist country and that, whilst China is nominally communist, it has undergone substantial liberalisation since the late 1970s. Another caveat is that, in a couple of the cases, selection of the comparison country or countries was somewhat arbitrary. An important issue is that of data-quality. One possibililty is that the Maddison data are too noisy to be of much use. As a rudimentary check for this, I plot--for the year 1990--the Maddison estimates against the World Bank estimates for all those countries that had an observation in both data-sets (except the UAE). As the chart below indicates, the relationship between the two variables is strong. 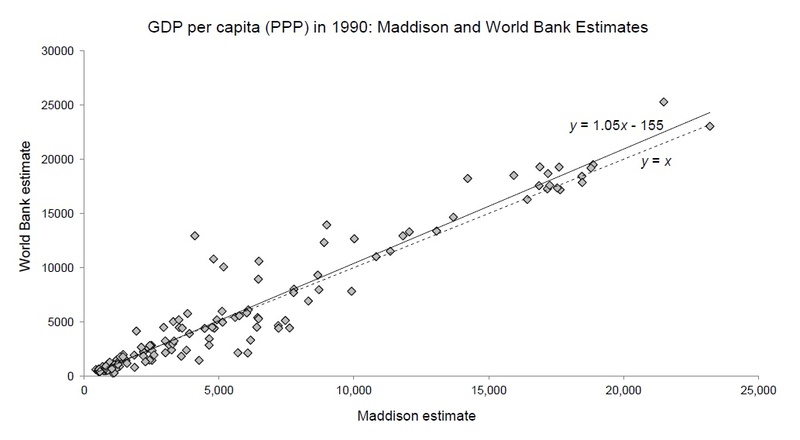 In addition, Maddison did not systematically over- or underestimate countries' per-capita productions. 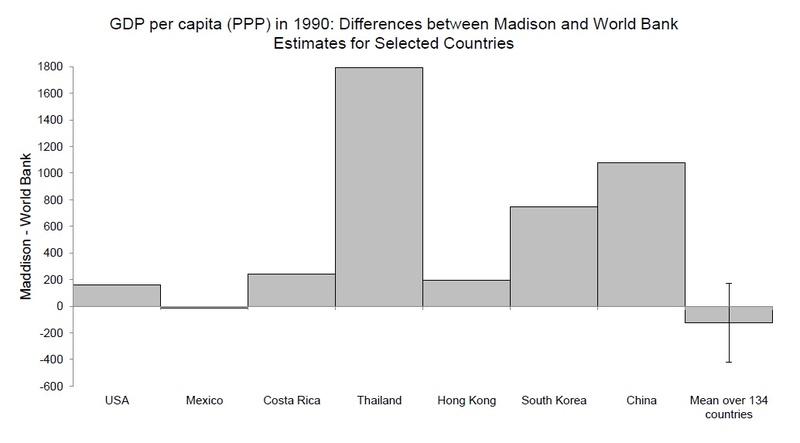 A second possibility is that Maddison happened to overestimate the per-capita productions of the liberal countries I selected, and happened to underestimate the per-capita productions of the communist countries. As a rudimentary check for this, I plot the difference between the two estimates for all those countries that had an observation in both data-sets. 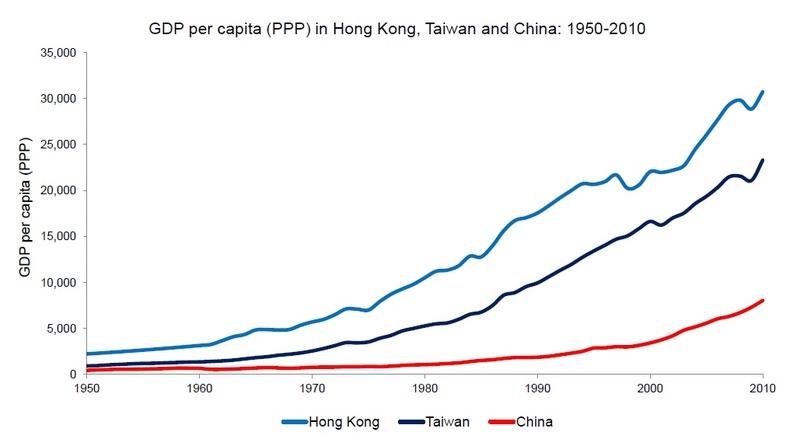 As the chart below reveals, compared to the World Bank's analysis, Maddison overestimated the per-capita production of South Korea and Thailand, as well as China. 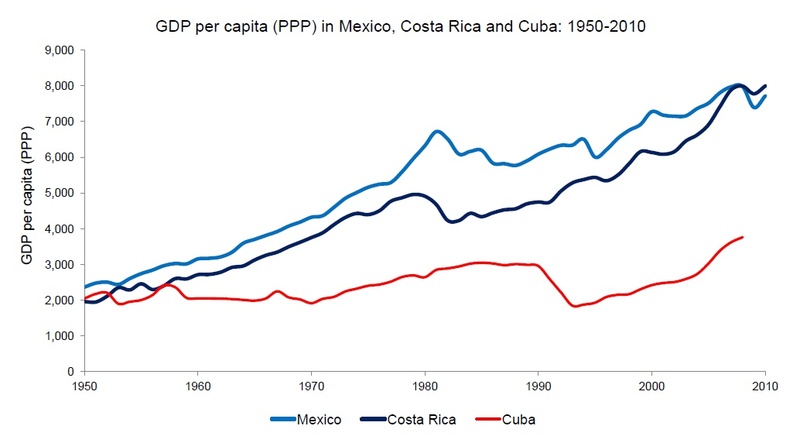 However, these disparities are not large enough to account for the smaller increase in per-capita production under communism in the relevant cases. I obviously cannot rule out the possibility that Maddison completely misestimated the per-capita productions of the USSR, Cuba, Cambodia and North Korea. 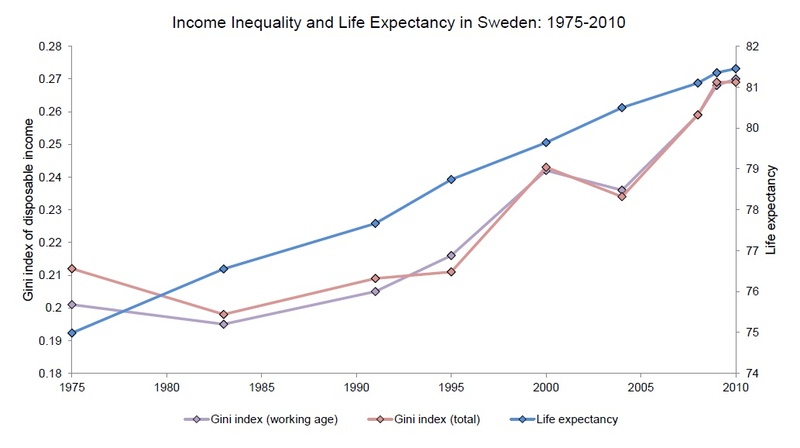 Is income inequality associated with life expectancy over time? In The Spirit Level, Wilkinson and Pickett argue that "equality is better for everyone". In particular, they argue that inequality is detrimental to health. According to them, the higher the level of inequality in a country, the worse the health of that country's inhabitants. 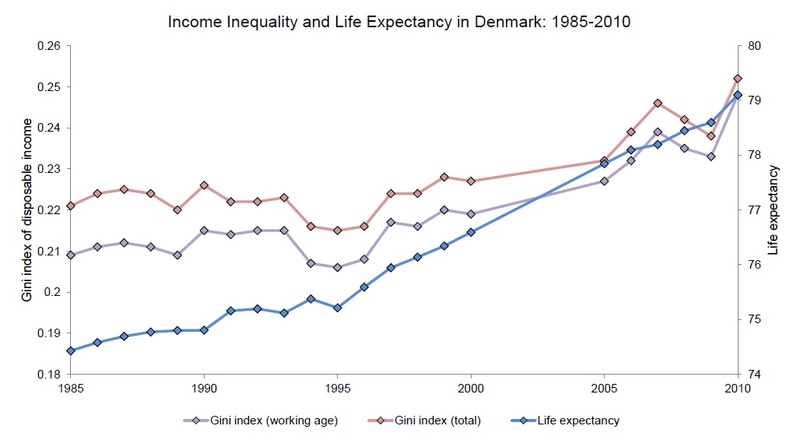 In addition to citing a large number of epidemiological papers which allegedly support their view, they plot income inequality against life expectancy for a cross-section of advanced countries, and find a weak negative relationship. Indeed, the only original contributions their book makes to the analysis of relevant data are simple bivariate charts. Given that Wilkinson and Pickett chose not to carry out any detailed analyses, why didn't they at least plot income inequality and life expectancy over time? Here I do just that, using data from the OECD and World Bank. 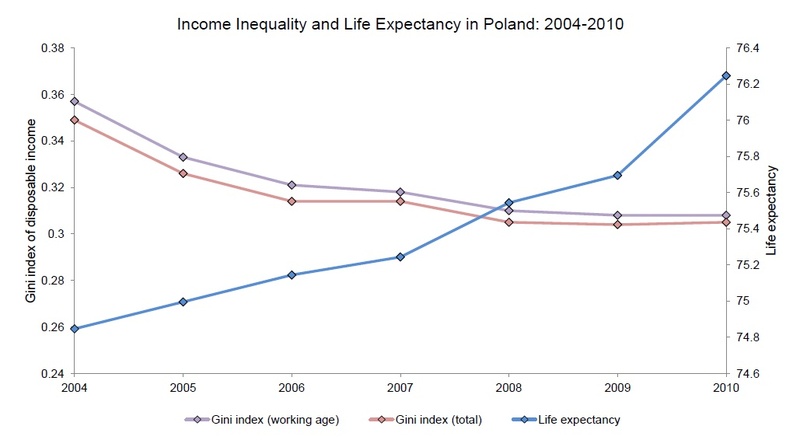 The first chart shows the relationship between income inequality and life expectancy in Poland since 2004 (the earliest date for which I could find data on income inequality). Poland, interestingly, is one of the few advanced countries in which income inequality has fallen in the last decade (at least when measured by the Gini index). 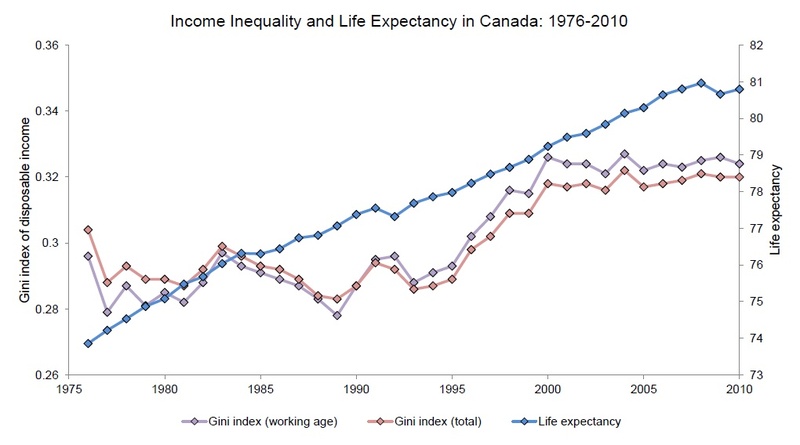 As the chart indicates, income inequality and life expectancy were negatively correlated over the period in question. Wilkinson and Pickett's hypothesis therefore gains support from this example. But how are the two variables related in other countries? 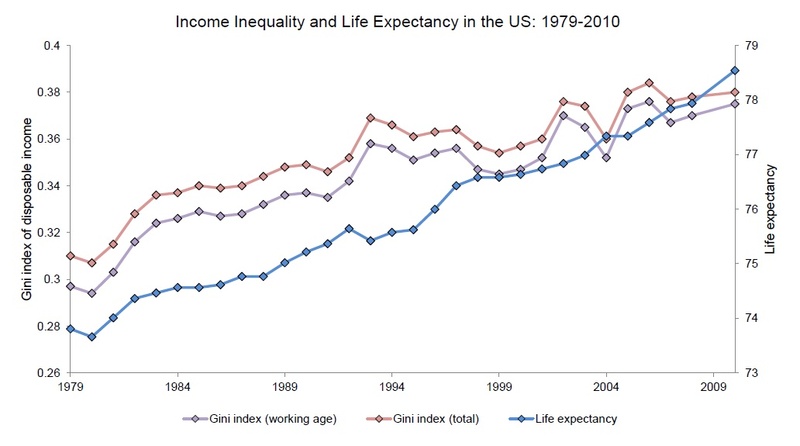 The charts show that, in general, both inequality and life expectancy have increased since the late 1970s. Indeed, life expectancy has increased more-or-less linearly in every country. 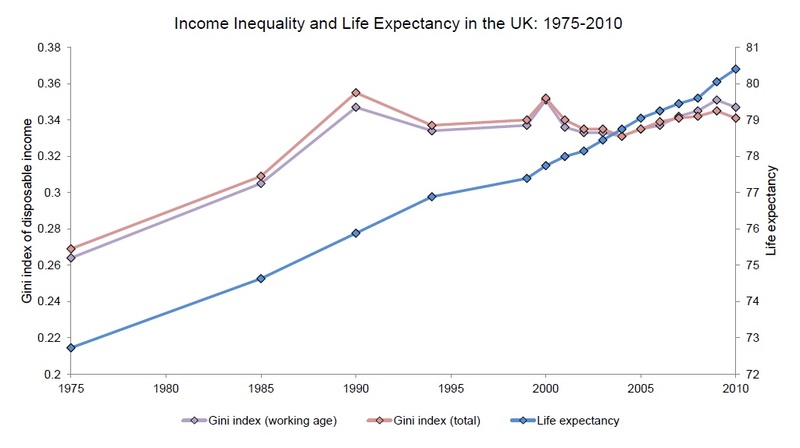 Contra Wilkinson and Pickett then, one could infer that inequality enhances life expectancy! However, a more parsimonious interpretation--I would argue--is simply that income inequality does not per se affect life expectancy. 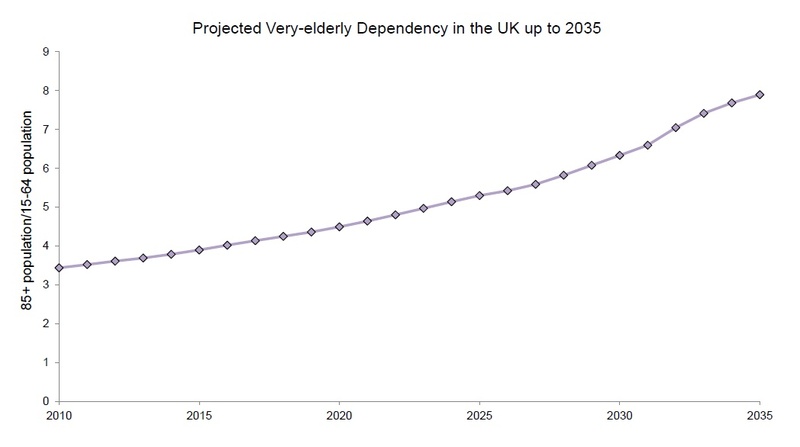 How might old-age dependency change in the UK over the next three decades? 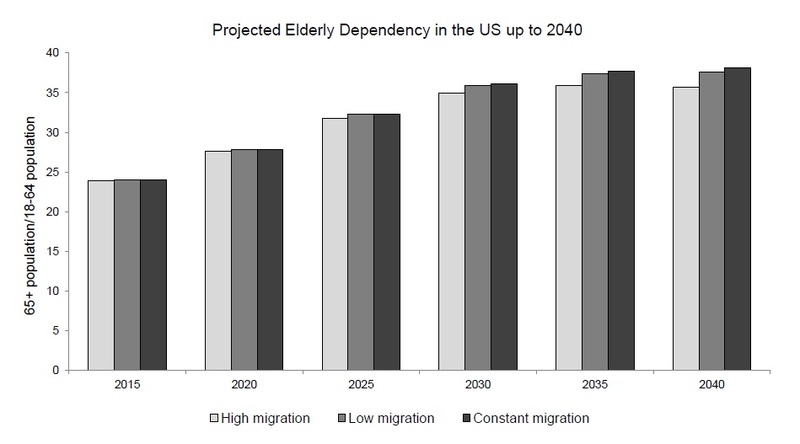 Yesterday, I presented charts indicating how old-age dependency is projected to increase in the US over the next three decades. Today, I present similar charts for the UK. Data are from the Office for National Statistics. 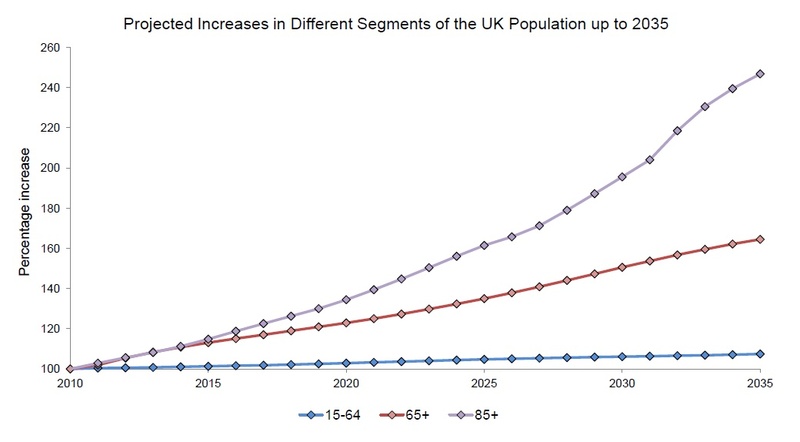 The first chart shows the projected percentage increases in three different segments of the UK population up to 2035: those of working age (15-64), the elderly (65+), and the very elderly (85+). The second chart shows how the elderly dependency ratio is projected to increase over this time period, while the third one shows how the very-elderly dependency ratio is projected to increase. 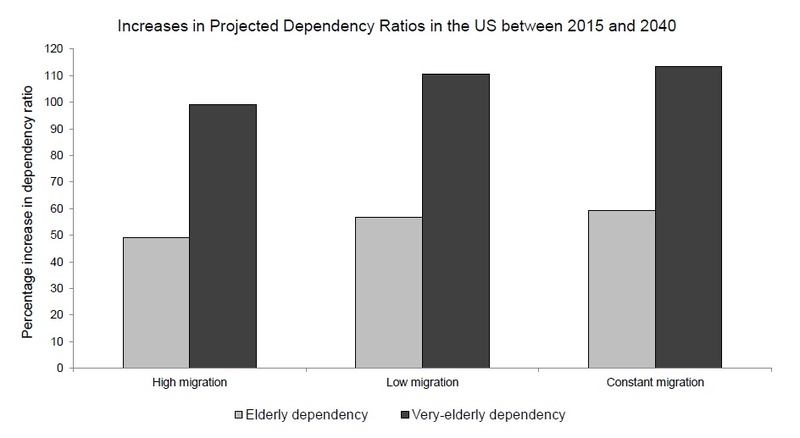 The percentage increase in the projected elderly dependency ratio is ~50%; the percentage increase in the projected very-elderly dependency ratio is ~130%. 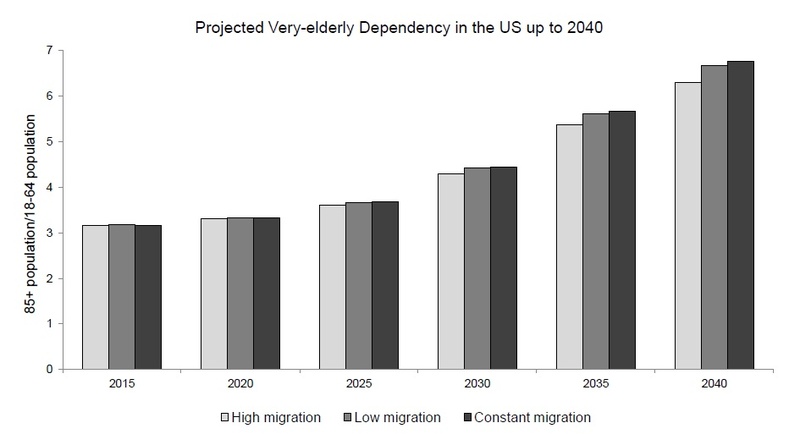 How might old-age dependency change in the US over the next three decades? In industrialised countries, population ageing is one of the central policy issues of present times, particularly insofar as it relates to the debate over pensions and social care costs. Here, I present a few graphs showing how old-age dependency is projected to change in the US over the next few decades. Data are from the US Census Bureau. The first chart shows the projected increase in what I've called elderly dependency (the population aged over 65 divided by the working-age population) under three different migration scenarios. The second chart shows the projected increase in what I've called very-elderly dependency (the population aged over 85 divided by the working-age population). This chart is an informative accompaniment to the first one given that a disproportionate amount of individuals' lifetime healthcare costs are incurred in the last few years of life. 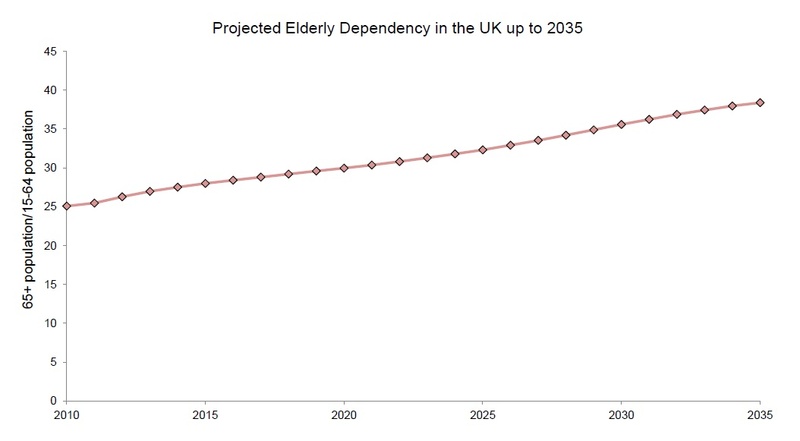 The third chart simply shows the percentage increase in these projected dependency ratios over the time-period in question: elderly dependency is projected to increase by around 50%, while very-elderly dependency is projected to increase by around 100%. According to the US Social Security website, Americans may be elligible for social security as early as 62 or as late as 70, depending on the circumstances. My reason for choosing age 65 as the cutoff-point for old-age was simply that the US Census Bureau data are aggregated into 5-year age intervals. 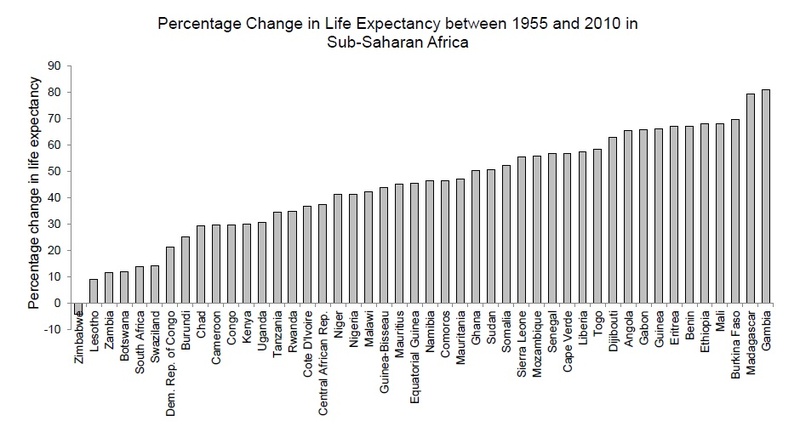 How much progress has Sub-Saharan Africa made in reducing mortality? Yesterday I read Social Determinants of Health Inequalities by Michael Marmot, which was published in the prestigous medical journal The Lancet. One of Marmot's arguments is that "Differences in adult mortality among countries are large and growing." In particular, he claims that between 1970 and 2002, "mortality rose in Africa [...] whereas it declined in the world as a whole." What evidence does he provide for this claim? He begins by dividing African countries into two groups, a high-mortality group and a low-mortality group. He then plots the probability of death between ages 15-60 over time, separately for the two groups of African countries. His charts show that mortality was more-or-less flat for the low-mortality group and had risen for the high-mortality group. 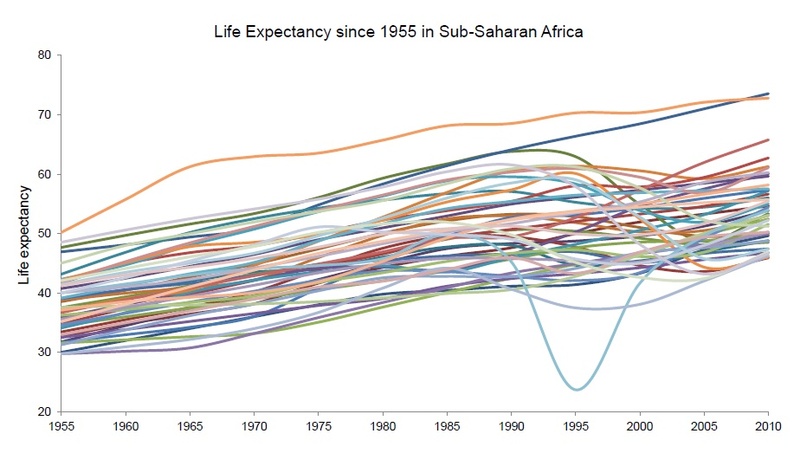 Is this a fair description of mortality trends in Sub-Saharan Africa? Not at all. First, there is no reason to arbitrarily partition African countries into a small number of groups on the basis of their mortality levels. And second, Marmot's measure of mortality--the probability of death between ages 15-60--is highly sensitive to a population's age-structure, and so is not very useful for comparative purposes. 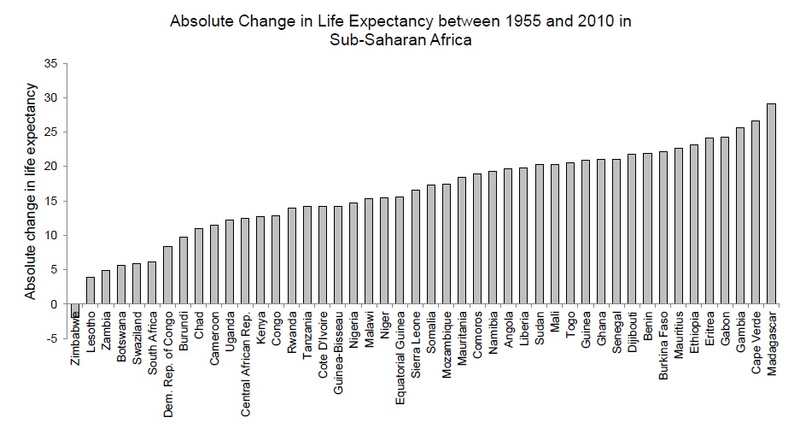 The charts below present a more accurate picture of how mortality in Sub-Saharan Africa has changed since the 1950s. With the unfortunate exception of Zimbabwe, every country has made progress. Moreover, a large number have enjoyed substantial gains. For instance, the typical Gambian now lives a full 25 years longer than she did in 1955. Indeed, the average increase in life expectancy over the time period is >16 years. And the average increase in life expectancy over the shorter time period that Marmot considered is nearly 8 years. Incidentally, the large dip in the light blue line corresponds to the tragic Rwandan genocide. And the regional dip during the mid-1990s corresponds to the HIV/AIDS epidemic. Data are from the UN. 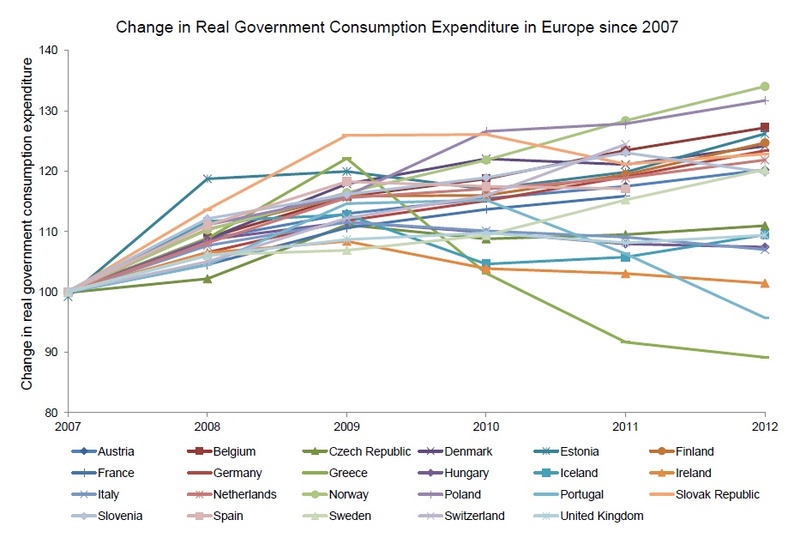 Further to my last post, here is a chart showing change in real government consumption expenditure between 2007 and 2012 for a large number of European countries. Data are from the OECD. As a friend of mine reasonably points out, these figures do not include government investment (which may well have decreased over the time period in question). Nor do they account for population increases. Indeed, the total European population increased by 1.8% in 2009, 1.9% in 2010 and 1.7% in 2011. What kind of austerity does Europe have? The Financial Times lexicon defines austerity as "official actions taken by the government, during a period of adverse economic conditions, to reduce its budget deficit using a combination of spending cuts or tax rises". As anyone with access to newspapers, TV or the internet will know, Europe is currently under a regime of austerity. But what kind of austerity? As the FT definition makes clear, austerity comprises either spending cuts, tax increases, or some combination of the two. In this blog post, Constantin Gurdgiev examines IMF data on 20 European economies in an attempt to answer the question posed above. In particular, he looks at changes in tax revenues, government expenditures and budget deficits between 2003-07 (pre-crisis) and 2012 (post-crisis). He finds that tax revenues as a percentage of GDP have increased in 12 out of 20 nations, and absolute revenues have increased in 19 out of 20 countries. He finds that government expenditures as a percentage of GDP have increased in 17 out of 20 countries, and absolute government expenditures have increased in all countries. Finally, he finds that budget deficits (calculated both ways) have increased in 17 out of 20 countries. His main conclusion is that austerity in Europe has mainly comprised increases in taxes, rather than reductions in spending. One response to Gurdgiev's descrptive analysis is that government expenditures have been cut relative to projected increases. Another response is that countries' GDPs shrank so much during the crisis years (2007-08) that increases in taxes and expenditures as a percentage of GDP were, in a sense, inevitable.